What is Grants to Blocks? The City of Escondido has set aside money to help neighborhoods improve and help homeowners enhance their property. The maximum grant is $5,000 per project; however, smaller requests are encouraged. These grants do require a dollar for dollar match. 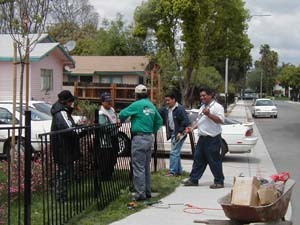 Volunteer labor can be used as the match and will be valued at $12.00 per hour. Volunteers will be enrolled as members of the City of Escondido's Volunteer Program. Funding will be on a reimbursement basis. Applicants must submit receipts for all materials covered under the grant. No reimbursement will be made for work started prior to approval. Improvements must be located within an area that meets HUD low income guidelines (contact staff for verification). Improvements made to the exterior of the property or visible from the street. How Can Our Project Qualify For This Grant? Three or more neighborhood families (property owners or legal representatives) must participate together on a project to be eligible. Nonprofit organizations may be the applicant provided the services benefit a low-income neighborhood and meet all other requirements. Improvements need to meet all City building and zoning codes. Applicants will meet with City staff to determine project eligibility prior to submittal of grant application. Appointments can be made by calling Karen Youel, Housing & Neighborhood Services, at 760-839-4518. Yard cleanup for an elderly citizen, widow, etc.